Q: What actor(s) have you particularly enjoyed working with? 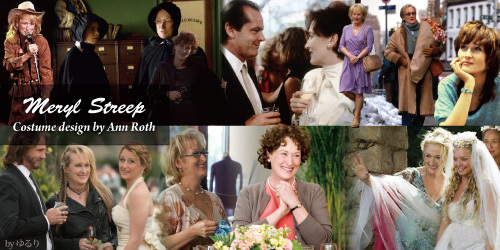 Ann Roth : I've worked with Meryl [Streep] forever; she's a wonderful person. There are movie stars and there are actors and they're not usually the same people. I'm not usually asked to do movie star-driven pictures because I don't know how to dress them to be whoever they want to be. I'm dressing the character, not the actor.